A delightfully fun and playful narrow river (more creek-like than not) in central Wisconsin, located just outside of Waupaca, the Crystal is a charming little paddle. Time: Put in at 2:30p. Out at 4:30p. Wildlife: Great blue herons, turtles, big fish, crawfish and kingfishers. Since this same stretch has been written about already, I shall be brief and merely emphasize that it is a great little river, offering accurately named clear water and continual riffles that are tons of fun. There is one Class I rapid and it’s a hoot. Since the water level is never all that high, you’re never really in any danger. The portage at the dam by Little Hope Mill Pond is indeed steep, so caution is advised but it’s nothing too tricky. Also, adding the last 2/3 of a mile to an already short trip, is well worth it. The reason this trip is so short is the river itself is only some 10 miles long. It begins at Long Lake, one of the Waupaca “Chain O’ Lakes” and then drains into the Waupaca River itself after a dam, just east of downtown Waupaca. After the Shadow Road bridge there are no access points until the Highway 22 bridge, which is not recommended. To extend this trip, it is advised to do so before the river (i.e., through the chain of lakes, pardon me, chain o’ lakes). Marl Lake, which is close to Hartman Creek State Park, does look lovely and surreally aquamarine. I had fantasized about putting in somewhere within the park itself, paddle the eponymous Hartman Creek into the “chain” and then wend my way down to the mouth of the Crystal. Alas, the lack of rain and low water levels precluded this whimsy. But I bet it could be done in early spring, though I advise calling the park first: 715-258-2372. Fun riffles! And for such a narrow stream and a relatively short distance, this stretch of the Crystal offered a surprising diversity: a wider lake-like section, tall banks, adorable houses (the town of Rural, in case such a name itself isn’t adorable enough, is just about cut and pasted from fairyland and is as cute as it is quaint). Also, this is a great area for road bicycling (see info below). Too short! And you will likely encounter a good amount of tubers (not the vegetable root-type). Waupaca, while not as resorty as places like Minocqua or Lake Geneva, is definitely a destination for tourists. (You know you’re being pandered to as a vacationing Illinoisan when (at a gas station not all that terribly far from Green Bay…) Chicago Bears and Cubs swag is being sold! That and the potential for overhead arrows flown over my scalp (but I doubt this is too serious a risk). The sign advising you to take caution is pretty funny; it comes suddenly and inspires a spirit of resignation, for what are you going to do…? I will, and add to it, some of the “chain” lake sections. I will for sure paddle the section of the river upstream from the Main Street put-in. 3.75 miles. A nice pedal (on bike) with no real hills to contend with. Maximum Relaximum at the put-in at Main Street. Where the yahoos take out. Little Hope Mill Pond Dam. Relatively steep portage at Little Hope mill pond dam. The covered bridge in Little Hope. Take-out in no uncertain terms. The Crystal River is just that, crystal clear and it’s as charming as the city of Rural that it flows through. It’s never very deep and you’re never far from civilization so it’s about as family-friendly of a paddle as you can get. Time: Put in at 12:00p. Out at 1:30p. The Crystal River is just that, crystal clear and it’s as charming as the city of Rural that it flows through. It’s never very deep and you’re never far from civilization so it’s about as family-friendly of a paddle as you can get if you enjoy a little excitement on the water. There is a lot to love and it’s understandable why it’s a very popular canoe and kayak destination. Rural is a tiny little town that seems to take pride in manicuring itself around the river (I’d be lying if I said I wasn’t envious of owning property alongside such a peaceful and beautiful stream). The put-in off Main Street is a unique little start to the journey with a couple of bridges that split the river in two. The Crystal is mostly sand and rocky-bottomed with only Junction Lake and the Little Hope Mill Pond offering up some weeds. The river is generally narrow throughout with countless riffles. The class I drop before Rural Road bridge is easy and fun to paddle through. There are plenty of fish to startle on your journey and I came across a few turtles as well as a couple cranes. It was a beautiful Saturday and I was surprised to have only encountered one other group of paddlers but I’ve heard it gets quite busy on the weekends. I do recommend portaging the dam and continuing on to Shadow Lake road. It extends the journey and taking out at the pond is a little anti-climatic. The dam has a pretty easy portage but the walk down is a little steep so use caution. Lastly, I’m not sure what kind of sign this is but this was the second time in two Waupaca-area paddles where I paddled through nuptials. A wedding was taking place at the covered bridge and I was relieved that I didn’t wipe-out and interrupt the priest. The lake section and more specifically, the Little Hope mill pond are pretty stagnant flat water sections. The pond was quite low so I had to get out and drag my kayak a good distance until I sunk down to my knees in some amazing quicksand-style muck. 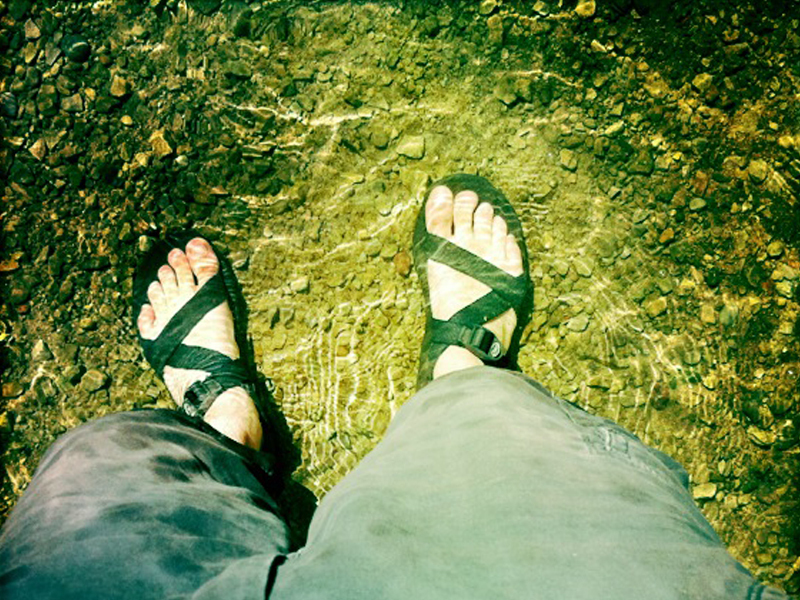 Had I not been wearing my trusty Chacos I would have lost a dear friend (it’s happened). I skipped the upper section to avoid lake paddling (something I’m not a fan of) but next time I’m all in because it’s such a great little river and it’s almost too short (but you can’t knock a river for that). Also, if you are in the area, stop at Marl Lake. It’s a beautiful turquoise-colored lake and you could start your paddle there (as suggested by Morrall River Films) and make your way through the connecting lakes all the way down to the southern part of Long Lake where the Crystal begins. You can find Marl Lake by heading West on Rural Road. Before you get to Hartman Creek State Park you’ll take a right on Whispering Pines road. The put-in will soon be on your left. The parking lot was full when I stopped, as was the lake, with lots of canoe, kayakers and even a paddle-boarder. The put-in off Main Street in Rural, Wisconsin. The best drop of the paddle is right before the Rural Road bridge (before it meets County Road K). Passing under the Rural Road bridge is fun too. Open water on the Little Hope Mill Pond. Portage upstream left of Dam. Footbridge with a charming sign to remind you that you’re passing a gun & archery range. The take-out at Shadow Lake Road. Unless this is some strange Rural ritual, a lot of people lose their shoes in the Crystal.